Hillsboro Mole Control is a full service professional mole and gopher control company. Hillsboro just west of Portland is know for it's farming and forest area. These are beautiful to look at but make mole problem's very common because they live in these wooded areas and make there way out into the fields. The most common way to solve these problem's is to set up a mole trapping service in Hillsboro. We customize each plan to make sure we can solve your mole problem and also work with each customer to find the best way to control future problems. We never sell you a service we do not think you need and take pride in our work. We are a family business and have over 40 years of animal damage control. We do not use poisons or electronic methods to remove moles from yards. We do not think these methods work nor do we believe they are a responsible way to control mole damage in Oregon. 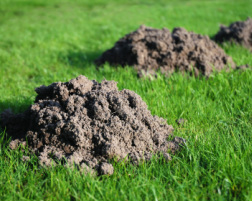 Hillsboro mole trapping services can help to get rid of moles in your yard. We setup traps on the main travel tunnels to make sure the moles are removed quickly. Moles are always digging new tunnels and creating more or larger dirt mounds. This can kill the grass and create soft ground that could collapse. Mole trapping is the method that we use on all our jobs. We have found that when you trap and kill the nuisance mole, it is the quickest method to stop the damage. 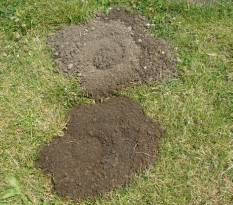 Hillsboro gopher trapping is our second most common service and one that is many times confused with moles damage. They are very similar at first site, but with our years of experience we are able to identify the difference. The main difference is the method to trap gopher's and moles. Gopher's are much larger than moles so in Oregon trap's must be different. Gopher's are notorious for destroying garden's and plants in your yard or garden. Trapping gopher's in a garden can be very difficult and frustrating because the soil is usually very soft. This makes the tunnels very sensitive, but we have found ways to still remove gopher's from your garden in Hillsboro. Voles are often confused with mice and are commonly referred to as field mice. They borrow under into golf ball sized holes that are connected underground with tunnels. Most people do not even know what a vole is until the damage is very large. We have handled many vole job from large fields to small yards. No job is to large to too small. For help with Mole and Gopher Control contact us today!